Learning is a key theme that has permeated through every strand of the Flodden Project, from archaeological training excavations and workshops to archival courses and talks. Lifelong learning really has been at the heart of the project, with participants developing core, transferable skills that will enable them to pursue their own research interests or take part in future heritage projects. Therefore, with adult learning largely covered by the archaeology and documentary research strands, the Flodden Education Programme was aimed at children and young people in formal and informal educational settings; school pupils being the key targeted group. Schools were eager to engage with the project and in the three years since the 500th anniversary of the battle, over 10,000 children from Northumberland and the Scottish Borders have participated in Flodden learning activities with the Ecomuseum’s learning team. It is little wonder that schools were keen to get involved. The Battle of Flodden was an event of great historical importance and huge cultural significance, particularly in the Scottish Borders where echoes from this past event still resonate through cultural events, folklore and music. For many children the past can be a distant and abstract concept but the cultural links to Flodden, still very much alive today, helped them to connect with this aspect of their local heritage. 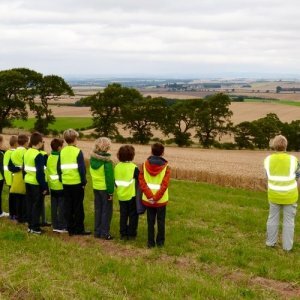 Pupils from Chirnside Primary School stage an impromptu minute’s silence on Branxton Hill on 9th September 2015, just one month after Coldstream’s Flodden ride out thundered up the same hill to commemorate the battle. Our main aim was to increase awareness and understanding of the Battle of Flodden, while setting it in a broader historical context. Many of the children we worked with, particularly in the Scottish Borders, had grown up with their local Flodden stories and although our aim was never to go out on a myth-busting mission, we wanted the children to understand the importance of evidence. Finally, through a series of outdoor learning activities at ecomuseum sites, we aimed to enhance a sense of place and identity, pride and ownership by increasing the value that children place on their local environment. We worked closely with Linda Bankier, the project’s archivist and Chris Burgess, archaeology manager, to develop a series of learning activities. Wherever possible, primary sources of evidence were used. These included documents transcribed by the documentary research volunteers and artefacts recovered by the archaeologists. Schools were offered workshops in class to help set the scene, followed by a full day ‘Flodden Field Trip’; taking in three ecomuseum sites, including Etal or Norham Castle, Heatherslaw Mill and Flodden Field. The Flodden Project was unusual in that we were able to offer pupils ‘real‘ experiences, whether it was transcribing 16th century documents or taking part in real archaeological excavations, pupils were given the opportunity to learn through a process of experience and reflection (experiential learning). The ecomuseum model offered us a great deal of flexibility, enabling us to work in partnership with a number of historical and cultural sites and organisations, both large and small, national and local, from English Heritage to the Flodden Peace Garden at Crookham. This model also has great cross-curricular potential. As well as the obvious history topics, we had some pupils working on film and media projects while others were focussing on conflict and conflict resolution. A class from Lilliesleaf Primary School near Selkirk visited Flodden Field and the Flodden Peace Garden before going on to have lunch with pupils at Ford First School in Northumberland. This visit was designed to support their peace and reconciliation topic. What do the lumps and bumps on the ground tell us? Pupils were encouraged to interpret features in the landscape. How to detect different types of metal using a metal detector whilst understanding the need for careful recording and analysis of the finds. Looking at census records and photographs from the mid 19th century to the early 20th century to search for evidence of the families who lived and worked Ford Moss Colliery. By studying the evidence – artefacts from the dig, old photographs and census records – pupils were able to piece together a picture of what life was like in this small, rural mining community over one hundred years ago. The Flodden Education Programme has been a great success, engaging thousands of individuals from both sides of the border, raising awareness and understanding of the battle. As a cross-border project it threw up a number of issues: we had two different curricula to support – the English National Curriculum and the Scottish Curriculum for Excellence – and two sets of term dates, but this only encouraged us to work in close partnership with local schools. We have also worked collaboratively with archive and archaeology staff and volunteers which has, we believe, been of great benefit to us all.